The map below shows Boston in 1882, with the original peninsula highlighted. Geologically, native Boston was a delta for the Charles, Mystic, and Chelsea Rivers. The swirling waters created an odd shaped peninsula with a thin neck of land at its base. The three largest hills on the peninsula were cut down and used as fill during the 1800's. In the image below, Beacon Hill is the peanut shaped circle on the left, Copp's Hill is the large circle at the top, and Fort Hill is on the right. Also visible is Tri-Mountain or Tremont, which was the original English name for Boston. The Hill with Three Tops is gone, and today is just called Beacon Hill. The three peaks were known as Beacon Hill (where the State House now stands), Mount Vernon, (at Louisburg Square), and Pemberton Hill (at Pemberton Square). Tri-Mountain is located in the center below and can be described as an upside down triangle with the peanut-shaped hill on the bottom. 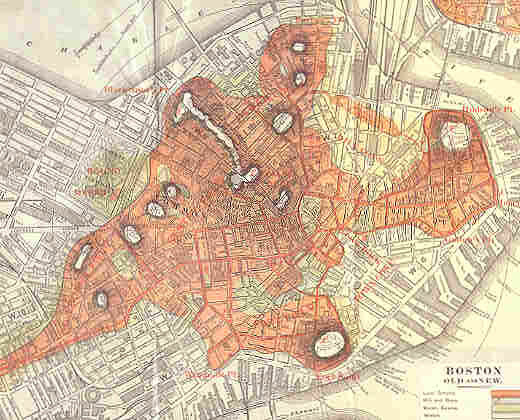 The three small hills in lower center were located in Boston Common. The Charles River is on the left, and actually once bordered the Common. In the early 19th Century, areas of the city were filled in to create the current topography. Simplified, Copp's Hill was cut down to create the West End, Fort Hill was cut down to create the Financial District, and Beacon Hill was cut down to create the Back Bay. Interestingly, the tower at 60 State Street near Faneuil Hall was built on filled land. Its foundation was the largest "cement pour" in history until that time (1976), to guaranty a solid base. The Big Dig tunnels are located in filled areas, and is the reason why a lot of water penetrates the soil.